I. to pour in, upon, or into (syn. invergere). Charmaine Smith co-founded Infundo Consulting in 2007. After working as a key associate since 2008 to co-develop and integrate systems work into Infundo Consulting, Gail Wrogemann joined as fellow Director in 2015. Infundo Consulting is a social enterprise focused on performance across all industries; based on working with and shifting Human Behaviour. Infundo has focused predominantly on the development space: education; community development; District and social impact across geographical areas as well as into corporate spaces which include a focus and understanding of development as a platform for transformation. This reflects our ongoing passion for impact across South Africa and the African continent. Infundo Consulting is based in Johannesburg with impact in all 9 provinces across various contexts; and more recently working into the Rest of Africa - impacting 9 other African countries. Working predominantly in education; but also more broadly in communities Infundo commits to looking for and designing sustainable solutions. Our associates and partners are all committed to our country’s future; for sustainable improvement in our societies and communities. They are all truly African; sharing a common heart for Nation Building. Infundo’s expertise is on facilitating shifts in individuals --> teams -->organisation and communities/systems to deliver greater results. This includes personal, team and systems performance; technical skills development; business coaching and systems integration; and the use of bespoke tools for self-monitoring and self-regulation. Each new project combines social impact and sustainable business practice. Infundo has grown to include 2 Directors; an office manager and Trust administrator Asandiswa Lusiki. Our scholarships team is made up of Evelyn Gwasira; Gail Ramsey and Haydn Everitt-Penhale; and a total of 30 associates, coaches, process experts and facilitators in a continual learning space. 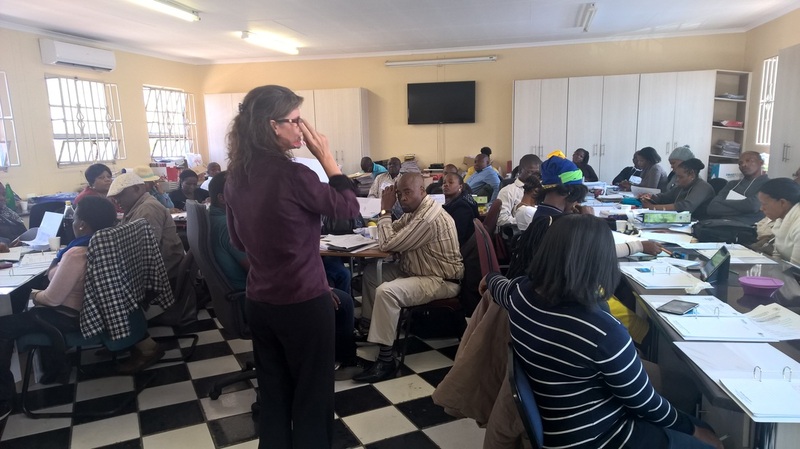 Working with teachers at Alex High as part of a community programme including 7 schools in Alex on behalf of GIBS.